German chancellor Angela Merkel will not be able to attend the opening of the G20 summit in Buenos Aires, Argentina. Her government plane was forced to change course whilst crossing Europe and reverse due to a technical defect. The plane is currently blocked in Cologne whilst the German chancellor will now have fly to Argentina by regular airline service. The German government aircraft 'Konrad Adenauer', an Airbus A340-300, had to make a reversal after one hour of flying over the Netherlands. It landed safely in Cologne. It is not the first time that the plane malfunctioned. Both Minister of Finance Scholz at the IMF summit in Indonesia, and President Frank-Walter Steinmeier on his Africa trip, suffered from technical problems. 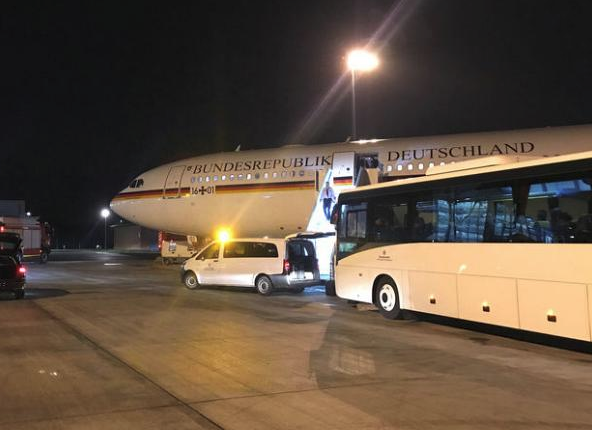 However, German daily the ‘Rheinische Post’ reports this Friday morning, on the basis of sources within the security services, that the emergency landing of the German government aircraft with Chancellor Angela Merkel on board was possibly the result of sabotage. The incident is being investigated as a "criminal act." Cause was a technical failure. The experienced pilot would have stated that there was an "unprecedented failure of the communication system." Such a failure was not considered possible, according to sources within the security services. Merkel was on her way with, among others, Minister of Finance Olaf Scholz to the top of the G20 in Buenos Aires. She misses the opening due to the delay. The speculation in the German press as to who could be responsible for an apparent act of sabotage against the country has already started, with most analysts looking East towards Russia. OR , Maybe she just did not want to be seen with Trump at the opening ceremonies. If it was sabotage - better luck next time.